Written by emily whittemore on Wednesday, October 14th, 2015 at 9:00am. There’s a new record label in Southern California, and it’s based right here in America’s Finest City™. Running a Stax/Muscle Shoals model, The Redwoods features bands ranging from soul to psych-folk to good ol’ rock and roll, each carrying its own timeless sound. The label’s unique blend of experienced session musicians forms a talented house band that’s worked with the likes of TV on the Radio, Karen O, Kelis, and more. This month, The Redwoods released a sampler of all their artists, including music from The Midnight Pine, Birdy Bardot, Dani Bell & the Tarantist, and many more. The first sampler released by the label also hosts an exclusive song by Rebecca Jade & the Cold Fact which features saxophone by Karl Denson of The Greyboy Allstars and The Rolling Stones. The low-fi effects and sultry vocals are reminiscent of the opening to a James Bond film. The song offers thought-provoking lyrics such as, “It takes love to hate,” while musically making a seamless transition from ’60s cool to ’70s rock. This track leads you down a psychedelic path with a catchy rhythm featuring keys, chords, and staccato guitar. “Crave” is a dream-pop song that could easily play on repeat while you’re lying in bed at night with your new lover in your arms, staring at the ceiling, looking out the window at the stars, and thinking about how to make this head rush of oxytocin last. The soothing yet haunting voice of Shelbi Bennett sings you an acoustic lullaby, and the hydro-sonics of the ocean in the background lend imagery of the tide pulling us toward the one we love. Canzona sings a pained, “you should go, it is the best thing you can do” amidst the kaleidoscope sounds of a Wurlitzer. The weaving desert folk harmonies of Rodger Molina and Shelbi Bennett are supported with the melancholy cry of the pedal steel, played beautifully by Dan Cervantes. The sampler culminates with The Midnight Pine’s cover of Radiohead’s “Exit Music (For a Film),” which gives a nod to star-crossed lovers. The common thread among all the songs, regardless of sound or style, is the universal lyrics speaking to topics of the human condition: love, loss, regret, and desire, with Al Howard’s labor-intensive percussion acting as a punishing yet cathartic penance. 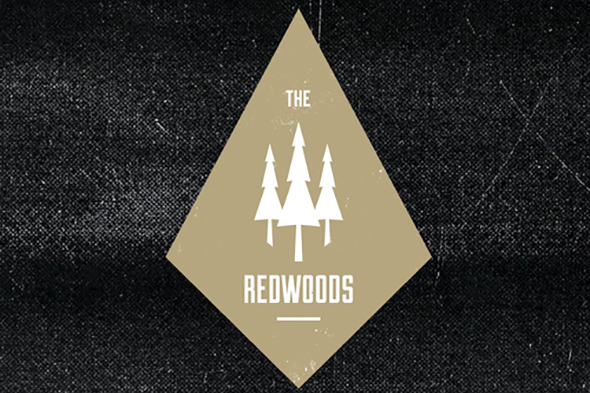 It’s a polished collection and evidence that The Redwoods’ bands are the real deal. You can download the sampler here or listen to it below. And don’t miss The Midnight Pine, Birdy Bardot, Erik Canzona & the Narrows, Creature & the Woods, and Dani Bell & the Tarantist at Soda Bar on November 14. They’ll all be performing as part of this year’s San Diego Music Thing, and tickets can be purchased here. These bands sound even better live than they do recorded, which is the hallmark of any great performer. Video Premiere: Soft Lions - "Digital Girls"